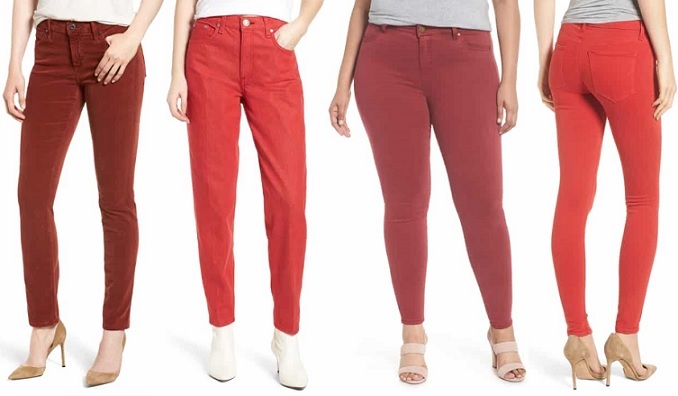 Are you actually looking for women's red jeans? Well, we hope you are because the reality is that you have found our page on the topic. In this women's clothing section of the Apparel Search directory, you will find all sorts of interesting information regarding red color jeans for women. Welcome to the worlds greatest guide to ladies red jean pants. "Jean" is heavy twilled cotton cloth, especially denim. Denim is a sturdy cotton twill fabric, typically blue (but can be made in a wide variety of colors), used for jeans, overalls, and other clothing. "Jeans" are hard-wearing trousers made of denim or other cotton fabric, for informal wear. Most often made of denim or dungaree fabrics. Often the term "jeans" refers to a particular style of trousers, called "blue jeans", which were invented by Jacob W. Davis in partnership with Levi Strauss & Co. in 1871. Traditionally, jeans were dyed to a blue color using natural indigo dye. Most denim is now dyed using synthetic indigo. Approximately 20 thousand tons of indigo are produced annually for this purpose, though only a few grams of the dye are required for each pair. For other colors of denim other dyes must be used. Currently, jeans are produced in any color that can be achieved with cotton. Red is the color at the end of the visible spectrum of light, next to orange and opposite violet. It has a dominant wavelength of approximately 625–740 nanometers. It is a primary color in the RGB color model and the CMYK color model, and is the complementary color of cyan. Reds range from the brilliant yellow-tinged scarlet and vermillion to bluish-red crimson, and vary in shade from the pale red pink to the dark red burgundy. Perfect color for Valentines Day. Red is a fantastic color for jeans. Always a good choice on Valentines Day. What is your favorite denim jean color? Jeans come in a wide assortment of colors, but the color is not the only attribute to set them apart from one another. You will find a wide assortment of style options regarding buttons, zippers, pockets, length, fit, etc. The appearance can vary based on special treatments as well. The used or "acid wash" look is created by means of abrading the jeans and/or treating them with chemicals, such as acryl resin, phenol, a hypochlorite, potassium permanganate, caustic soda, acids etc. Ripping or distressing of jeans, though also arising naturally as a result of wear and tear, is sometimes deliberately performed by suppliers. If you wish to go with a distressed look, this can be achieved regardless of the color of pant you have selected. It will work perfectly fine with red jeans as well as other colors. In addition to acid wash or ripping, if you would like the pants to have a worn appearance, sandblasting is another technique to give fabrics a worn look. Apparel Search is a leading guide to fashion, style, clothing, glam and all things relevant to apparel. We hope that you find this women's red jean page to be helpful. What ever type of pant you are wearing is in fashion. If you want to be even more stylish, you should wear your favorite trousers today. Learn more about jeans in our fashion product influence section. You may also have interest in reading more about ripped jeans & designer jeans. If you are a mom, you may want to know about mom jeans as well. If you enjoy denim, you may also want to research jean shorts, denim skirts & denim jackets. Check out more women's jeans. If you have some free time and wish to see some of the new trends or research pants from the pants, you are welcome to visit the fashion blog to read jean blog posts.